Housed in a restored cornmill in the picturesque village of Stoke Bruerne, the museum collection vividly portrays the heritage of 200 years of inland waterways. This fascinating and colourful insight into a transport system, fundamental to the industrial revolution in Britain, is complemented by the "living canal" outside with its flight of locks, boats and Blisworth Tunnel. Explore the mysteries of this intriguing part of our heritage through working models, videos, pictorial and three dimensional displays portraying every aspect of the waterways. From amazing feats of engineering to the shinig brass and colourful decoration that contrasts so sharply with the harsh reality of canal life, you will find something to interest all the family. The Canal Museum welcomes school parties and eductional visits. Specialist staff are available to assist teachers and students in planning visits and projects. School/Activity room available. Please ring for details. Always full of interesting items, the Museum Shop stocks fine quality souvenirs, postcards, painted canalware and a wonderful selection of waterway gifts, guides and publications. 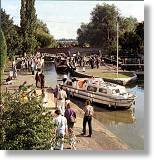 In particular we offer the most comprehensive range of canal books in the country. Cruise along the Grand Union Canal on one of the trip boats operating at Stoke Bruerne. 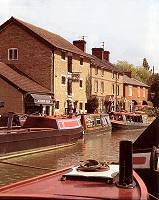 Stoke Bruerne offers two pleasant canalside walks. The short route to the Blisworth Tunnel is tarmac and suitable for buggies and wheelchairs, or follow the towpath down the flight of seven locks. There are also 3 restaurants, a tea room and 2 pubs in the village. The Canal Museum is south of Northampton, 10 minutes from both the M1 (J15) and the A5.